The Columbus Blue Jackets will welcome back a familiar face today, as the team has recalled veteran forward Mark Letestu. Letestu has spent the entire 2018-19 season in the minor leagues, recording 26 points in 39 games for the Cleveland Monsters. The team has also activated Markus Hannikainen off of injured reserve. It wasn’t so long ago that Letestu was a valuable depth center for the Edmonton Oilers, recording 35 points in the 2016-17 season and then trailing only Leon Draisaitl in playoff scoring for the team. That performance was quickly followed by some disappointing results for the veteran, and Letestu found himself fighting for a job last summer. After attending training camp on a professional tryout with the Florida Panthers, Letestu settled for a two-way contact and a placement in the minor leagues. Not complaining for a minute, he’s been an important part of the Monsters forward group all season, and sits fourth in team scoring. A few days from his 34th birthday, it’s unlikely that Letestu plays a big role on the Blue Jackets this season. 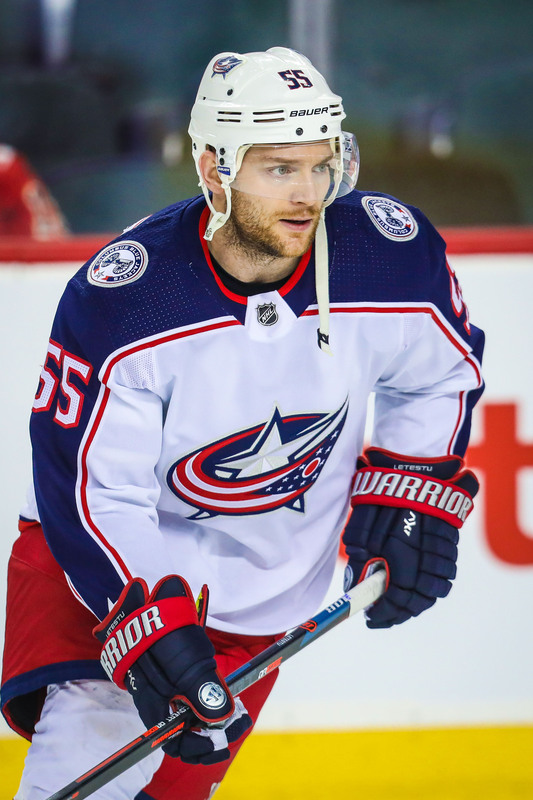 His recall is likely only insurance while center Boone Jenner deals with an injury that “flared up” after practice yesterday, but there is something to say about having that kind of experience at hand in the minor leagues. Letestu has played 558 games in the NHL and always been an effective two-way option, something that teams are always looking for down the stretch. Since the roster limits are relaxed after the trade deadline, perhaps Letestu will be kept in the NHL as an extra body at times when the Blue Jackets are dealing with minor injuries. Center Mark Letestu is returning to the Blue Jackets. The team announced that they’ve signed him to a one-year, two-way contract and have placed him on waivers for the purpose of sending him to their AHL affiliate in Cleveland. CapFriendly reports (Twitter link) that the deal will pay $750K at the NHL level, $300K in the minors, and contains a guarantee of $350K. The 33-year-old spent most of last season with Edmonton before being dealt to Columbus in advance of the trade deadline to give them some more depth down the middle. Between the two teams, he played in 80 games, scoring nine goals and 14 assists while averaging 12:51 per night in ice time. However, that was a big drop in his production as in 2016-17, he collected 35 points (16-19-35, a career high) and that likely played a role in him not landing a guaranteed deal until now. Letestu attended training camp with Florida but was cut earlier this week. The veteran is still an above average player at the faceoff dot, winning 53.3% of his draws last season and has a career mark of 52.1%. Accordingly, when the Blue Jackets suffer an injury or two down the middle, it wouldn’t be surprising to see them turn to Letestu as they know he can hold down a fourth line role without too much trouble, assuming he passes through waivers unclaimed on Friday. Another key checkpoint has been reached in Seattle’s quest to be awarded an expansion NHL franchise. The NHL to Seattle group announced that Seattle City Council unanimously approved their $700MM privately-financed proposal to renovate KeyArena to be the home for the team. Now with an arena agreement in place and approved, the focus now turns to getting the franchise awarded. Representatives from the Seattle group are expected to meet with part of the Board of Governors on October 2nd but a full vote on their expansion application isn’t expected until sometime in December at the earliest. The Blues received a scare on Sunday when winger Robby Fabbri had to leave after one period following a lower-body injury. Considering he has missed the bulk of the last two seasons with ACL tears, some were understandable fearing the worst. Fortunately, the news isn’t too bad as the team announced (Twitter link) that the 22-year-old is listed as day-to-day with a Grade One groin sprain. He’s not expected to suit up tomorrow night but could potentially be back by the end of the preseason. While it’s certainly concerning that he’s missing time already, it could have been a whole lot worse. Coyotes center Laurent Dauphin is getting close to being cleared for contact following offseason knee surgery, notes Craig Morgan of The Athletic (via Twitter). He split last year primarily between Chicago and Arizona’s AHL affiliates but already has 34 career NHL contests under his belt. If he is available near the start of the season, he could certainly push for a roster spot given their sudden uncertainty down the middle due to recent injuries. If the team wants to send him back to the minors, he will have to first pass through waivers. Following his release from the Panthers earlier today, unrestricted free agent center Mark Letestu plans to take a few days to assess how rosters are shaping up around the league before determining his next move, reports Aaron Portzline of The Athletic (Twitter link). The 33-year-old is still a reliable player at the faceoff dot and is only one year removed from scoring 16 goals in Edmonton. Portzline adds that a return to Columbus where he finished last season is a possibility though it may have to be on a two-way contract. Professional tryout season is upon us, and the Florida Panthers have announced that veteran center Mark Letestu will join them in training camp this year. A “PTO” as it is referred to is an agreement to have a player in camp without any obligation to sign them to an NHL contract. Many players on tryouts will eventually earn a deal somewhere—though, as the Edmonton Oilers found out not necessarily with the team they’re working with—but nothing is guaranteed for Letestu this time around. The 33-year old will be battling for his NHL life after spending the end of last season with the Columbus Blue Jackets. Aaron Portzline of The Athletic in fact tweets that if Letestu can’t find a one-way deal with the Panthers, there could still be a two-way contract waiting for him in Columbus. The two sides had talks recently, and the veteran center had several two-way contract offers. Though last season didn’t go as planned first in Edmonton and then Columbus, there is a good chance that Letestu can still be an effective player. It was just two seasons ago that he recorded 16 goals and 35 points for the Oilers before being one of their best players in the postseason. For a Panthers team that is looking to compete in a tough Atlantic Division, giving a chance like this to Letestu makes sense. The team isn’t incredibly deep down the middle, and has several unproven young players trying to lock down spots in the bottom-six. Battling out a veteran like Letestu for that opportunity can only improve their performance, and there is a real possibility that he has enough left in the tank to contribute this season. For what would likely be a one-way contract under $1MM, he may be able to snag a spot on the Panthers roster. Poll: How Many Remaining Veteran Free Agents Will Sign? With just one day left in July, free agents have had a month to find employment in the NHL. Last summer, there were less than 20 unrestricted free agents signed after the end of July through the beginning of the regular season. This off-season, there are a plethora of notable names left on the market, but at this point is is unlikely that they all find a new home in the league. The question now is how many of these top names get lucky. Rick Nash could find a landing spot if he wanted to. The six-time All-Star is currently evaluating his future in hockey versus his health after suffering yet another concussion this season. Should he decide to return, he would likely have more than a few teams interested in a short-term deal. If Nash opts not to return, the top-scoring forward from last season left on the market is actually Mike Cammalleri. Cammalleri, 36, quietly put up 29 points last season after a hot start with the Los Angeles Kings and then a trade to the Edmonton Oilers. The former point-per-game player is not quite that kind of scorer any more, but could still contribute to a number of teams. Benoit Pouliot was a perennial 30-point player until he turned 30 and has struggled the past two years. In the right situation, he could still make an impact. The same goes for Mark Letestu, Drew Stafford and Jannik Hansen. Ales Hemsky was highly productive before injuries derailed his career, but remains a possible high-ceiling gamble if back at 100%. Other available forwards bring more of a two-way game such as Daniel Winnik, Scott Hartnell, Scottie Upshall, Chris Stewart, Antoine Vermette, Jussi Jokinen, Tommy Wingels, Jason Chimera, Joel Ward, Dominic Moore, Matt Stajan, and Lee Stempniak. There are also some younger options like Alex Chiasson, Nick Shore, Logan Shaw, Tomas Jurco, and Freddie Hamilton. On the blue line, Luca Sbisa is reportedly drawing interest from several teams across the league. Although he suited up for just 30 games with the Vegas Golden Knights, he managed to register 14 points and plays a strong checking game. It would seem that Sbisa is in line for a contract at some point. But what about Toby Enstrom? A free agent for the first time in his long career, the well-respected veteran was expected to land a contract early on but still remains unemployed. Enstrom has always been a reliable presence on the back end, but at 33 years old, he has shown signs of slowing down. Other aging options on defense include Alexei Emelin, Johnny Oduya, Kevin Bieksa, Dennis Seidenberg, Kyle Quincey, Paul Martin, Josh Gorges, and Jason Garrison. However, experience may not be able to outweigh ability with many younger defenseman still out there. Brandon Davidson, Cody Franson, and Paul Postma seem like players who should be signed, while Justin Falk, Frank Corrado, Ryan Sproul, and Duncan Siemens are all intriguing targets as well. In net, the options are pretty straightforward. One would think that Kari Lehtonen, Steve Mason, and Ondrej Pavelec had all done enough in their careers to earn a continued stay in the NHL, especially when there are no other legitimate goaltenders available at this point. Yet, its hard to pinpoint three teams that need another option in goal. These three keepers may need to wait until injuries strike to find work. So, how many of these remaining free agents will sign before the season starts? Mark Letestu has been a useful bottom-six center around the league in recent years but has yet to be signed for next season. Here is a closer look at his situation. The 33-year-old started off last season with the Oilers and while he fell short of his point per game average from the year before, he was still relatively productive given his role with 19 points in 60 games. That resulted in some trade interest before the deadline and he was flipped to Columbus. With the Blue Jackets, he didn’t fare as well. He was used solely as a fourth line faceoff specialist which resulted in his output dropping considerably with just four points in 19 games. His playing time was slashed by more than three minutes per night in the postseason and he was fairly quiet overall. There’s a good chance that this has affected his market so far. Despite that, as someone who has averaged better than 50% at the faceoff dot throughout his career, Letestu should attract some interest as a specialist while as much as he didn’t light it up with Columbus, he has been a decent point producer in previous years. That’s likely the argument that his representatives are making in negotiations. Center depth is something that contenders often look to acquire at the trade deadline but it wouldn’t be surprising for some rebuilding teams to show some interest as well. In those cases, the team would want Letestu to serve as a bridge for a youngster that isn’t quite ready yet and then look to flip him at the deadline. In the East, while Carolina added Jordan Martinook when they dealt Marcus Kruger earlier this offseason, he’s better utilized on the wing which could make an opening for Letestu. He’d also serve as insurance if youngster Martin Necas struggles in training camp. The Flyers were looking for a third line center earlier in free agency but they may look to fill that role internally. Washington should have some room to work with to upgrade their bottom six and their center depth behind their top three options is somewhat limited. Toronto is believed to be high on Par Lindholm for their fourth line spot but they could certainly look to Letestu to add some competition for that position. The options aren’t quite as plentiful out West. San Jose has cap room to work with and could use him on their fourth line. Anaheim added Carter Rowney earlier this summer but Letestu would be an upgrade over him; Ducks GM Bob Murray is known to tinker with his fourth line midseason so this would represent an opportunity to improve beforehand. Chicago now has cap space but the return of Kruger doesn’t really leave room for Letestu to work with. We had originally projected Calgary to sign him but they added Derek Ryan in free agency as well as Austin Czarnik, who has played center at times as well so there isn’t a great fit there now either. Letestu ranked 40th on our Top 50 UFA list and had a projected one-year, $1.75MM contract. It’s hard to envision him getting that amount now that most of the comparable depth centers have gone elsewhere and there aren’t a lot of vacancies left. However, he’s not in a situation where he should have to settle for close to the league minimum either given his track record. Something in the middle (between $1MM and $1.25MM) now appears to be a more likely outcome at this time. The Pittsburgh Penguins could be without rookie forward Zach Aston-Reese long-term. Actually, head coach Mike Sullivan described the injury as “longer-term”, though he refrained from putting any specific timeline on his return. He did say that Aston-Reese suffered an upper-body injury in practice, which is why he missed last night’s game, a 3-2 loss to the New Jersey Devils, and will presumably miss many more. While the Penguins made a splash with their acquisition of center Derick Brassard at the trade deadline, Aston-Reese has been a point-per-game player since being recalled to Pittsburgh, spending ample time beside Sidney Crosby. Fortunately for the two-time defending Cup champs, they are also deep at wing and should have no trouble making up for the loss of Aston-Reese in their top-nine. While the Penguins lose a man to injury, the rival Blue Jackets add one. Columbus announced today that captain Nick Foligno has been activated from injured reserve. Foligno missed more than a week with a lower body injury suffered against the Penguins back on the 18th. However, he’s returning to the lineup sooner than expected. The Blue Jackets are thankful for Foligno’s quick bounce back; not only are they looking to solidify their playoff position, but they also lost forward Josh Anderson to long-term injury recently. Fortunately, Foligno’s return and the additions of Thomas Vanek and Mark Letestu at the trade deadline make for a timely situation to replace Anderson. Speaking of trade deadline injury replacements, the Bruins could not be happier with how their additions played in the absence of Patrice Bergeron last night. When a player of Bergeron’s caliber goes down, the team always suffers. Bergeron will be out at least two weeks with a fractured foot and it showed right away last night on the defensive side of the match-up, as Boston surrendered three easy first period goals to the Carolina Hurricanes. However, it was Rick Nash and Tommy Wingels leading the charge to a comeback victory. The pair of new Bruins combined for two goals and an assist in 32 minutes of ice time as Boston won 4-3.